Happy Birthday America! I got this jacket on sale at Banana for a great deal! Loved wearing it with my sequin top and skirt! Always nice to have for cool summer evenings! Have a fabulous independence day! Stay Safe! Enjoy! Thanks Annie! 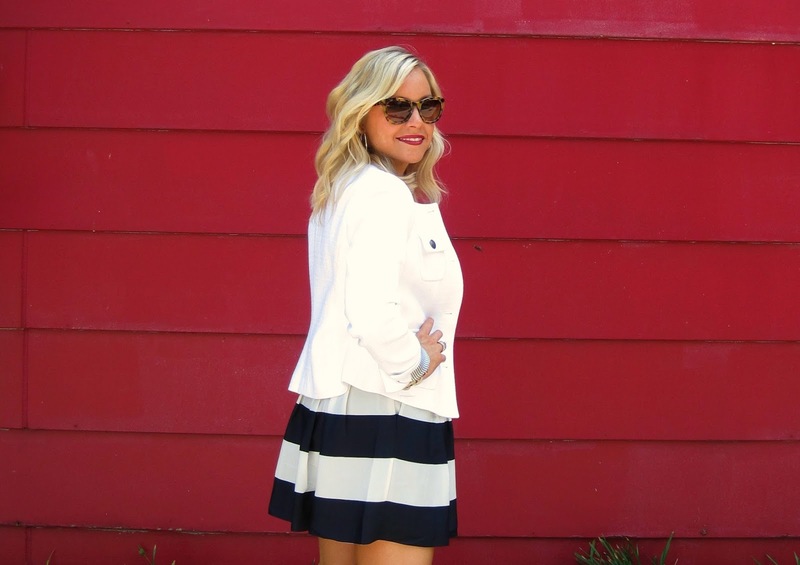 This skirt is so fun and lightweight! Thanks for reading! Hope you had a good forth! Going to head over to your blog! Thanks Ginny! You are so sweet! Hope you had a good 4th yesterday! Totally love this patriotic outfit! Your skirt is SO cute! The skirt is so light it was wonderful! Plus,it was 50% of at J.Crew factory! Really love it! That mix of textures is like perfection! Always fun to mix textures! Lovely look girl. I really like your skirt with that cute top! Happy 4th! The skirt and top were both sale items! Love when that happens! Love this outfit. So pretty. The skirt is fabulous. Thanks for linking up. Love your style! So happy to linkup! Great minds think alike, because I am totally wearing the same skirt! Love it!! You look adorable in your 4th of July outfit! Have a great holiday! This skirt is just fabulous! This skirt is going to get a lot of use! Loved how you styled the skirt! Hope you had a good holiday! That sequin top is so incredibly chic with the striped skirt! This outfit was so easy to put together! Both pieces are very lightweight! Such a great outfit...love the sequins and stripes together and the jacket really finishes the look. Your hair is so pretty btw! Thank you! 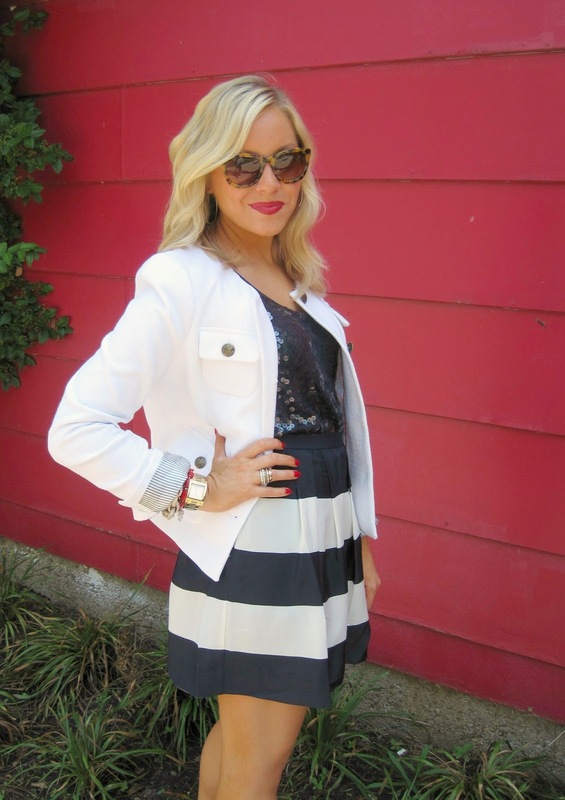 Sequins and stripes are so fun! I will hair to wear a combo like this again! Thank you for reading! The skirt is adorable and I love the fun sparkles! Sparkles on the fourth seem appropriate! this skirt is adorable on you - short enough to be flirty but not tooooo short, ya know? Thank you! I agree! Love the length of this skirt! Perfect for staying cool! I love this skirt! It was 50% off at J.Crew factory! So glad I got it! Heading over to your blog! OMG! Hello darling woman! That skirt with the top and jacket are just darling together! Thank you! I have a feeling this skirt is going to get a lot of use! I am in love with it! It was perfect for the 4th! You look fabulous! I love the color combo and the red wall just perfect for the background. I knew this red wall was perfect to add in to this festive post! Added my pop of red for the 4th! Very cute! 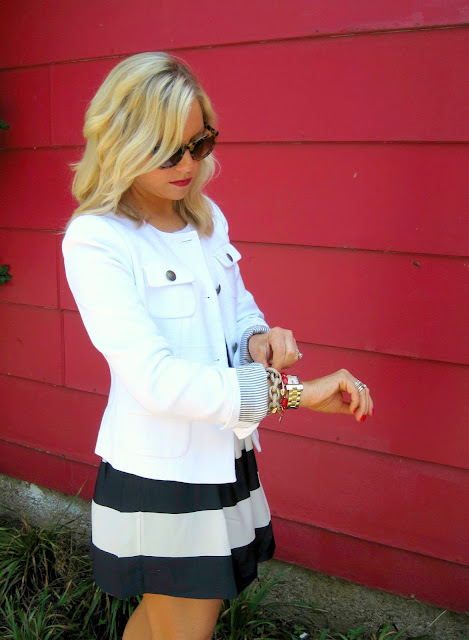 Visiting from the trend spin link up!